Crime Prevention Training by PC Allen, Humberside Police - at 1.00 pm on Monday 24th June at The Fiddle Drill, Goodmanham. The Automated External DEFIBRILLATOR (AED) is located at All Hallows Cottage (next to the Goodmanham Arms). Please call 999 first in order to obtain the access code to open the cabinet. 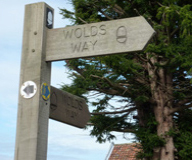 PLANNING APPLICATIONS Please note that the Parish Council can only make recommendations to East Riding Council, but every application is considered. All applications are accessible on the planning portal of the East Riding Council website (www.eastriding.gov.uk). The Community Beat Manager for this area is PC John Day (email: John.Day@humberside.pnn.police.uk). Passing information onto the police enables them to take action. FREE SCHOOL TRANSPORT to Market Weighton Infant and Junior Schools - As a condition of the village school closing in 1967, East Riding Council provide transport to school for 4 -11 year olds living in Goodmanham. SEVERE WEATHER - Goodmanham residents can collect bags of ROCK SALT from behind the curved wall to the right of the entrance to Manor Farm. Supplies will be replenished as necessary and Mr & Mrs Stephenson are contactable on 01430 873510 or 07779 246214. There will be a planning meeting on 8th May 2019. The next quarterly meeting, which is the AGM, will be held on Wednesday 22nd May 2019. The council's Code of Conduct and a summary of Councillors' Disclosable Pecuniary and Non-Pecuniary Interests are available on the Parish Council News tab, under Localism Act 2011.